What does it mean to gather in the name of Jesus? What does it mean to say that all are welcome, and all means all? Are there no boundaries? No qualifications? No form of accountability? Are there protocols we should be aware of? Who decides what these protocols might be? As Disciples, we pride ourselves on our theological openness. We don’t have a creed. There are no theological grounds for excommunication. Instead of focusing on boundaries, we focus on our center, which is our common confession that “Jesus is the Christ, the Son of the Living God.” Even that confession allows for breadth of interpretation. But, does that really mean that anything and everything goes? The word we’ve heard this morning from Matthew 18 is a challenging one. It’s also unique to Matthew’s Gospel. This suggests that there’s something afoot in Matthew’s community. Someone or some group is causing problems, and Matthew wants to set up a process to handle the problem before it gets out of hand. When it comes to church discipline, there’s always the danger of abuse and misuse. Down through the ages, religious authorities have used threats of excommunication, banishment, and punishment to silence dissent. With our history of sending heretics to the stake to burn, it’s understandable why we shy away from overt forms of discipline. Besides, in the age of social media, church discipline can bring bad publicity! While this passage lays out a process of church discipline, the focus isn’t on punishment. The focus is on reconciliation. This focus becomes clearer when we read it in context. The parable that precedes our text focuses on finding lost sheep. The passage that follows is a conversation about forgiveness. When we read the passage through this lens, then what we see is a process of accountability designed to restore broken relationships. That is important, because none of us is perfect. All of us will occasionally say and do things that hurt our sisters and brothers in the community. So, here’s a process that is designed to heal that breach in the relationship. Instead of airing our dirty laundry in public, Matthew’s Jesus tells his disciples to first go and seek out the person who has offended us and seek reconciliation. If that doesn’t work then bring two or three witnesses. If that doesn’t work, then and only then, bring it before the church as a whole. That way, we can try to prevent humiliation of the parties from occurring. I’m not an expert in conflict resolution, but it does seem better to put out fires while they’re still small, than to let them grow to unmanageable proportions. That’s a lesson I learned from Mr. Gray, my neighbor as young child, who was a Fire Control Officer for the Forest Service! The reference to binding and loosing connects the passage with Jesus’ commission to Peter and the church built upon his confession. This is a story about what it means to be church. Church can be as few in number as two or three, but never smaller than two. Church exists when those who gather do so in the name of Jesus. When this happens, Jesus promises to be present with them. That doesn’t mean Jesus isn’t present with us as individuals, but this is a reminder of the importance of community. As we’ll discover when Deanna Thompson comes in November, that community can be virtual in nature. But it still requires a gathering of some form. When it comes to the ongoing presence of Jesus with the church, there’s a thread running through the Gospel of Matthew. When the angel appears to Joseph and tells him that Mary’s child will save the people from their sins, the angel also informs him that Jesus will carry the name “Emmanuel, which means ‘God is with us’” (Mt. 1:18-23). This thread runs from chapter one, through this story and onward to the end of Gospel, where Jesus gives the Great Commission. With that commission Jesus promises to be with his disciples, always “to the end of the age” (Mt. 28:20). This is a thread we celebrate every time we gather at the Lord’s Table in the name of Jesus, who is made known in the breaking of bread (Lk. 24:28-31). One way to envision the nature of the church that is present in Matthew 18 is to read it in light of Paul’s description of the church as the body of Christ. While modern Christianity has been influenced by the Enlightenment emphasis on the autonomy of the individual, which has led to a consumerist understanding of the church, Paul’s vision of the church as the body of Christ is much more communal. Church members aren’t customers. They’re different parts of one body. The body of Christ is made up of many members, all of whom are important. Each of us plays a role in the body, and when everyone fulfills their role, then the body is healthy. We know that the Corinthian church was messed up. It was as dysfunctional as any church in history. Yet, it is in his letter to the Corinthian Church that Paul develops his theology of a Spirit-filled, Spirit-led, church. It’s here that Paul speaks most clearly about what it means to be the body of Christ. Paul’s hope is that this congregation, which is rife with conflict, can come to grips with its identity as Christ’s body so that God might be glorified. Since God has arranged the members of the body as God desires, there shouldn’t be dissension in the community. Here is the word from Paul that helps us understand this process of reconciliation: “If one member suffers, all suffer together; if one member is honored, all rejoice together with it” (1 Cor. 12:24-26). As Anna Case-Winters puts it: “the church is to be a community where both accountability and forgiveness are practiced” [Matthew, p. 219]. Getting back to that process of accountability that we have before us in Matthew 18, we know that in life there are rules and regulations that are designed to protect us and our neighbors. While it’s true that not all rules are the same, and that some rules need to be revised from time to time, most rules are designed for our safety. The government requires us to wear seat-belts when we’re in our cars, not because they want us to be uncomfortable, but because seat-belts and car seats for children save lives. Some of us can remember growing up before seat belts and car seats were required. We can all tell stories about riding in the back of pickups or playing unencumbered by any restraints in the back seat while traveling at high speed. That might have been fun and exciting as kids, but knowing what we know now, it’s a miracle that any of us is alive and well. When it comes to church accountability, I have a few regulations that I have to follow in order to stay in good standing as a pastor within the Christian Church (Disciples of Christ). One of those regulations is the requirement that I take boundary-training every five years. Those of you who have endured boundary-training, know that this can be mind-numbing at times. Many will agree that they really need to redo the films we have to watch. But, the training is there for a reason. It’s a form of accountability. It’s designed to protect clergy and church members from coercive and uncomfortable relationships. We take anti-racism training for the same reason. Even though we give each other a lot of theological latitude, the point here is that we need to be accountable for our behavior. It’s not appropriate to say racist or sexist things to one another. Even the way in which we show affection, like giving a hug, require a certain amount of discretion. Not everyone wants to be hugged. Or if they want a hug, they may not wish to be enveloped by the hugger. That’s one of the things we learn in boundary training. Yes, boundaries are there for a reason. They help us be accountable to each other, so everyone is safe. While everyone is welcome, not every form of behavior is welcome. Let us remember that when we gather together in the name of Jesus, we gather as the body of Christ. Not only do we gather in his name, but Jesus promises to be with us, always, until the end of the age. Picture attribution: Fonseca, Rico. 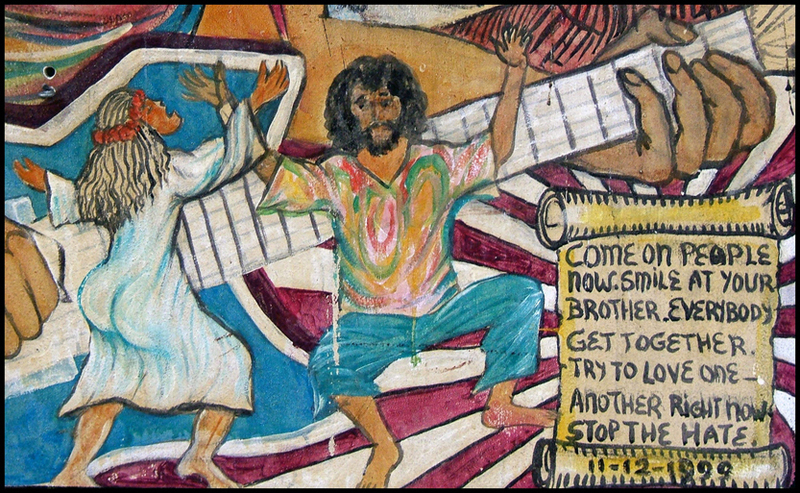 Smile on Your Brother, from Art in the Christian Tradition, a project of the Vanderbilt Divinity Library, Nashville, TN. http://diglib.library.vanderbilt.edu/act-imagelink.pl?RC=55211 [retrieved September 9, 2017]. Original source: http://www.flickr.com/photos/tonythemisfit/2569759440/.